Bizarre tube of goo spawns stunning moth! Bizarre and alienlike, a last instar Cecropia Moth caterpillar, Hyalophora cecropia, is adorned with colorful spined spikes. I lucked into this animal last Saturday, at the Midwest Native Plant Conference. One of the attendees, moth expert Kevin Clark, had brought some of his caterpillar livestock along, including this beast. And as further luck would have it, ace photographer David FitzSimmons was also in the house with all of his gear. Dave wanted to image the caterpillar, so he set up his white box, which is essentially a small white tent that allows him to display subjects on a clean background under controlled conditions. While I'm not used to shooting this way, Dave was kind enough to allow me some time with the caterpillar and white box, and the above photo is one of the results. Displaying an animal in this way makes for interesting images, and details really pop. This is how Dave shot all of the images for his award-winning Curious Critters book - check that out RIGHT HERE. 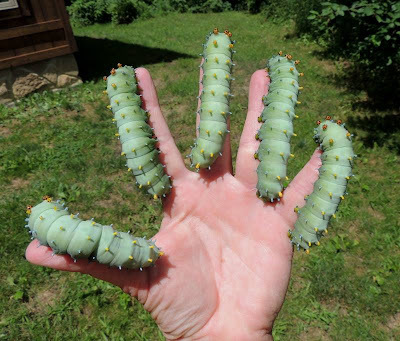 Cecropia caterpillars are big, nearly the size of a small hotdog. As far as eating machines go, they make Joey Chestnut look like a chump. All they do is eat, eat, eat, and grow, grow, grow. When a Cecropia cat first hatches from its tiny egg, it is hundreds of times smaller than the massive bruiser shown here. Through a series of molts, with each growth stage termed an instar, the caterpillar blows up into a truly awe-inspiring bag of goo. The colorful orange and blue clubs adorned with spines add a nice touch. If you're quiet, you can hear the caterpillar chewing from some distance away. Plant matter is vacuumed in via the mouthparts (shown above) and soon expelled out the other end in the form of frass (caterpillar poo). The frass pellets are substantial, and some people first discover Cecropia caterpillars by the ever-growing piles of frass below the feeding tree. Had I been on my game, I would have photographed that, too. Cecropias aren't overly finicky eaters, and have been found snacking on a wide variety of woody plants including birch, elm, maple, ash, cherry and many others. Tami Gingrich, who raises Cecropias, was kind enough to allow me the use of her beautiful image of an adult Cecropia. What a showstopper this animal is! It is the largest indigenous moth in North America (the increasing numbers of tropical Black Witches may change that), and is the size of a small bat. No one, and I mean no one, would not stop for a double-take if they spotted one of these moths. 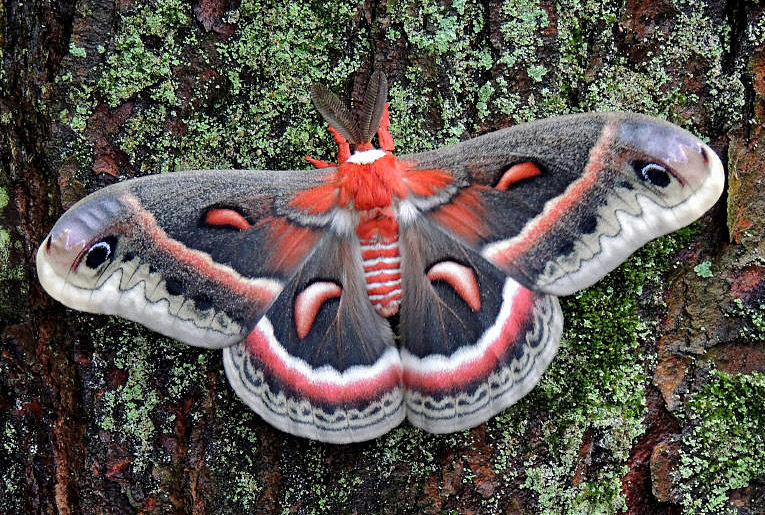 If someone were to ignore one of these marvelous moths, I would feel compelled to declare them devoid of intellectual curiosity, and in a later stage of nature deficit disorder. For all of their ornate beauty, the adult Cecropia, like the other giant silkmoths, will live for but a week if that. It has no functional mouthparts and adults exist only to find a mate, and reproduce. They are little more than incredibly showy flying gonads. 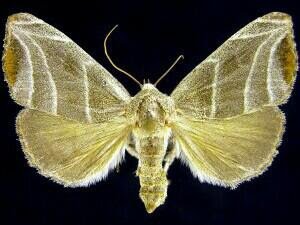 Once a pair has mated and the female has dropped her eggs, the moths soon wink out. It is the caterpillar stage that lasts by far the longest, and (arguably) is the most important facet of the moth's lifecycle. The Cecropias have a friend in Tami, who raises many of them. She's got quite a handful of cats here, and is lucky that her fingers don't have the taste and feel of cherry leaves. Keeping this number of livestock in food is no small matter - the caterpillar rancher must regularly harvest substantial amounts of foliage to stoke their insatiable appetites. Moths are truly bits of magic, transforming from odd-looking tubular goo-bags to some of Nature's most stunning winged creatures. Last weekend, July 26-28, marked the 5th annual Midwest Native Plant Conference, held at the Bergamo Center in Dayton, Ohio. Bergamo is positioned in the midst of 150 beautifully landscaped acres known as Mount St. John. This is an especially apropos setting for a native plant conference, as Mount St. John is heavily landscaped with native plants. One only need set foot out of one of the buildings, and the flora and fauna get interesting, fast. A staple of the conference and a key component of the event are vendors who specialize in native plants. Saturday is the big day for plant selling, and nurseries hawk all manner of cool plants along the entrance drive. In spite of damp weather, plenty of people came, saw, and bought. By now, there are many more native plants roots down in gardens around Ohio and beyond than there was prior to the conference. This is an important room - the dining hall. One of the great things about conferencing at Bergamo Center is that everything is nearly self-contained. Plenty of rooms for speaker sessions, good food, and nearly enough guest rooms for attendees. If not staying overnight at Bergamo, plenty of hotels are just minutes away. We pretty much pack the place with nearly 200 people, which is the limit for the facility. This year, the conference was sold out a month or so prior to the event. Get in early next year! We've thought about perhaps relocating to a larger venue - everything must be BIGGER and BETTER! - but event organizers are reluctant to do that. The conference seems to be just about the perfect size, and the people at Bergamo and Mount St. John are fabulous to work with. So, here it will stay, I think. Three basic ingredients comprise the conference: Vendors selling native plants; expert speakers discoursing on a variety of plant and ecological themes; and field trips. Between all of those things, it makes for a fast weekend. In this photo, we're in the room with Dawes Arboretum botanist Dave Brandenburg, who is giving a hands-on workshop in grasses and sedges. He's a topnotch teacher and lecturer, and packs 'em in. Dave's talk took place during breakout sessions, which offer multiple choices of talks. All of these lectures are repeated, which makes it possible for attendees to hear many of them. Read about all of the conference speakers RIGHT HERE. Each evening, and Saturday morning features a keynote speaker. Friday night saw the always entertaining Judy Burris and Wayne Richards speaking about butterflies and how to plant for these gossamer-winged insects. Dave FitzSimmons talked about building vernal pools the next morning, featuring the wetland that he constructed on his property. The scene above shows Saturday night's keynote, the legendary Doug Tallamy, author of Bringing Nature Home. He spoke about "Building Biological Corridors: Networks for Life", a fabulous presentation that brought the house down. Our other presenters included Cheryl Harner, Bob Henn, John Howard, Terry Fredrich, Janet Martin, Don Geiger, Macy Reynolds, and yours truly. Between everyone, they managed to cover an incredibly diverse array of topics. Field trips are an integral part of the conference - what good is all of this stuff if you can't get people out to enjoy it?! Always popular are the nocturnal forays around the grounds of Mount St. John, where we always manage to find a diverse assemblage of interesting beasts. Lisa Rainsong, Wendy Partridge and I combined to lead expeditions both Friday and Saturday night, and the ever-popular singing insects were a main target. This is a remarkably tame Oblong-winged Katydid, tolerating our nightlights quite well. It sounds a bit like a frog. We also featured "mothing" this year. 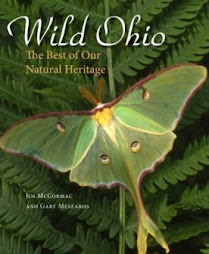 Mary Ann Barnett, Scott Hogsten and Roger Grossenbacher spearheaded the moth sheets and lured in a variety of interesting creatures. And all of this nighttime action within a few hundreds yards of the conference venue! The conference concludes with Sunday morning field trips to nearby biological hotspots, and a big thanks to Yvonne Cecil for orchestrating all of the trips. 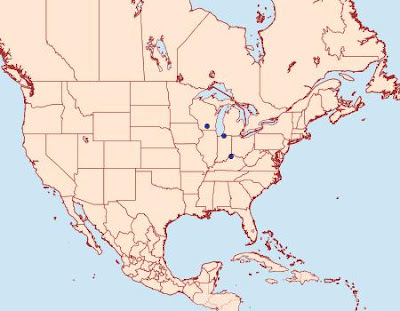 One of the main reasons that we initially selected Dayton for the conference is the number of high-quality prairies, fens and other natural areas in close proximity to the city. These habitats are at their peak in late July, and visiting them is a perfect close to a conference that is all about native plants and their conservation. I always lead the trip to Cedar Bog, and that's our group, above. Cedar Bog is also a recipient of proceeds generated by the Midwest Native Plant Conference, and to date we have raised about $2,000 for the Cedar Bog Association. 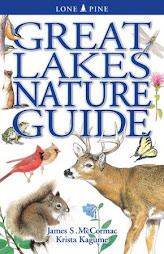 We also split conference proceeds between other worthy recipients, and the others this year were The Nature Conservancy's Sunshine Corridor Project, Marianist Environmental Education Center, Ohio Natural Areas and Preserves Association, and Beaver Creek Wetland Association. A huge thanks to all of the volunteers who manage this conference. I'm reluctant to start trying to name everyone, as I'm certain to forget someone, but you know who you are and everyone that is a part of the conference greatly appreciates your work! I will single out one person, and that's Diana Malas, who acted as our conference CEO this year and did an outstanding job! The Midwest Native Plant Conference is slated to take place on August 1 thru 3, 2014, at Bergamo Center. Registration usually opens in April. Be there! Your narrator's car, in a Madison County cemetery. My travels of last weekend put me within minutes of a fairly expansive graveyard, that's smack in the middle of one of Ohio's former prairie regions. The prairie is largely no more, having been converted to beans, corn, and wheat, but some of the prairie denizens continue on, including an interesting little mammal. A Thirteen-lined Ground Squirrel, Spermophilus tridecemlineatus, stands sentry duty. Distant as I was, the animal was on to me and ready to whistle a warning to his mates if need be. I've written about ground squirrels before, and I probably will again. I've invested many an hour watching them, and trying to make images, and consider it time well spent. 13-liners love short grassy areas, and adopt cemeteries readily. As the animals are colonial and dig extensive underground labyrinths, their presence doesn't always sit well with cemetery managers and they sometimes are eradicated. I hope that doesn't happen here. It didn't take long to find a burrow. A convenient bench was not far off, and I crouched behind that to await the surfacing of the squirrel that I had seen ducking into this hole. Thirteen-lined Ground Squirrels are true hibernators, even more so than Woodchucks. Probably the only other mammals that rival their Van Winkleian slumbers are the meadow jumping mice. The squirrels pack up and go subterranean in September or October, and don't poke above ground until late April or thereabouts. A few minutes of patience, and the little prairie dog popped out to see what the big bipedal dope was doing. I didn't move a muscle, other than to ever slowly hoist the camera into position, and was able to click off some shots without causing undue concern. These are not bold animals, and are normally quite suspicious of interlopers. Not surprising, since the squirrels are sausages on legs and many a predator would relish one as a meal. However, in areas of high people traffic, the ground squirrels have adapted to humans and can be surprisingly tame, such as can be seen HERE. When on alert, ground squirrels often stand erect, the better to spot threats. The anvil-headed almond-eyed critters are quite good looking, if you ask my opinion, and their behavior and habits make them all the more intriguing. Finally, after about ten minutes, the squirrel began to move away from the safety of its burrow, revealing its handsome pattern of dashes and dots. Thirteen-lined Ground Squirrels are no dummies. They thrive in the warmth of spring, summer, and fall. If things get too hot above ground, a cool subterranean retreat is never more than a few paces away. Come the cold, ice, and snow of winter, the squirrels go underground and sleep right through the whole mess. Not a bad gig! Not too long ago, I lucked into a good photo op with a semi-cooperative Hummingbird Clearwing moth, Hemaris thysbe, above. I wrote about the animal and that experience HERE. The hummingbird moth godz have been smiling on me, as last Saturday our group lucked into the other common species in the genus Hemaris, the Snowberry Clearwing, H. diffinis. I was co-leading an expedition into the fascinating Castalia Quarry Metropark in Erie County with Rick Nirschl, when the animal above darted in and began to work a patch of Wild Bergamot, Monarda fistulosa. Needless to say, the group was enchanted with the performance of the little speedster, which along with the other clearwing are occasionally referred to as "hummingbird mimics". But why would they imitate hummingbirds? To say they are a mimic is to imply that for some reason evolutionary processes have decreed that these moths gain some sort of survival advantage by resembling hummingbirds. I'm not sure this is a case of mimicry; I rather think it is convergent evolution at work. Flowers without "landing pads" such as the big flat petals of coneflowers, like Monardas, are out to attract moths and hummingbirds that are capable of helicoptering in front of the blossom and don't require a landing pad. As hummingbirds and clearwing moths are largely after the same fare, they have evolved similar adaptations and appearances. In any event, clearwing moths are surefire crowd-pleasers, and you'll want some in your yard I'm sure. To get them, plant Dwarf Honeysuckle, Diervilla lonicera, native (always native!) viburnums, Snowberry, Symphoricarpos albus var. albus, or Coralberry, Symphoricarpos orbiculatus. With luck, you'll one day find the marvelous bag of goo above noshing on your plants, which will (if all goes well!) turn into a Snowberry Clearwing. Should you be in or around Dayton this Saturday, stop into the Midwest Native Plant Conference between 9 am and 5 pm, when vendors will be hawking native plants, including, probably, some of the plants that I mentioned above. Not long ago, I came back to my car, and this little guy darted out from between two body panels. Yes! A jumping spider (species unknown)! He ran over to look at me, and I stared back just as intently. After telling it to wait a sec, I bolted the macro lens onto the Canon, and took a shot. If ever a spider could be called "cute", it would be a jumping spider. After the shoot, I coaxed him onto my finger and liberated the spider into some vegetation. Hopefully it is still out there wreaking havoc on the lesser beasts. The world is awash in beetles, and they come in all shapes and sizes. Few of them can match the intimidation factor of a Pinching Beetle, Lucanus capreolus, though. Those formidable looking mandibles look like they could slice off a finger. Today was one of those coolly diverse days. I started off down in Fayette County, visiting the farm of a friend. He has restored about 25 acres of wetlands, and the response by the animal community has been nothing short of phenomenal. Blizzards of dragonflies of many species, amphibians galore, and nesting Blue-winged Teal, Pied-billed Grebe, and Sora. Among MANY other things. And all in a short two years. Add water and they will come. Then, working my way home, I ducked into a Madison County cemetery that has a thriving population of Thirteen-lined Ground Squirrels, and shot images of our native prairie dog. Then, I stopped at a spot along Little Darby Creek, waded on in, and procured some pretty nice shots of various stream bluets and dancers. Finally, I dropped by Kathy Wallace's home, as she had tipped me to the discovery and capture of the protagonist of this story. I asked her if she'd please put the Pinching Beetle into captivity, as I'd like to do a shoot with it, and she was kind enough to do so. Pinching Beetles are fairly large as bugs go, and coupled with the large mandibles, they're enough to cause an entomophobe to faint. But as nearly all of these things are, they're totally harmless - all bark and no bite. Still, as can be seen by its scale as compared to your narrator's hand, a Pinching Beetle is a whole lotta bug. This insect also goes by the name of Reddish-brown Stag Beetle, but I prefer the Pinching Beetle moniker. There is an even larger species, the Giant Stag Beetle, Lucanus elaphus, which also has bigger mandibles. I've not seen that one, and have only seen about three of this species. I suspect that they're not that uncommon, but stay largely out of sight and out of mind. The larvae spend their existence burrowing through decaying wood, and the adults are mostly nocturnal. Adults feed on tree sap and probably the sap of rotting fruit, and if all goes well, one of these giant beetles can live for a year or more. As nasty as those "antlers" look, the beetle can't exert enough force to do anything but give a slight squeeze. I'm not sure what their purpose is; perhaps sparring with other males like deer in rut? Or perhaps intimidating would-be enemies. It may be that the males with the largest rack are the most desirable to females? The girl beetles, by the way, have greatly reduced mandibles that are scarcely noticeable, at least in comparison to those of the male. Pinching Beetles occasionally come to lights, so perhaps if you are lucky you will have this face staring at you when you step out onto your porch. An aerial view, courtesy Google Earth, of the intersection of U.S. Route 33 and Clear Creek Road in Hocking County, Ohio. I recently met someone here for a field trip, and suggested the gas station on the corner as a rendezvous point. 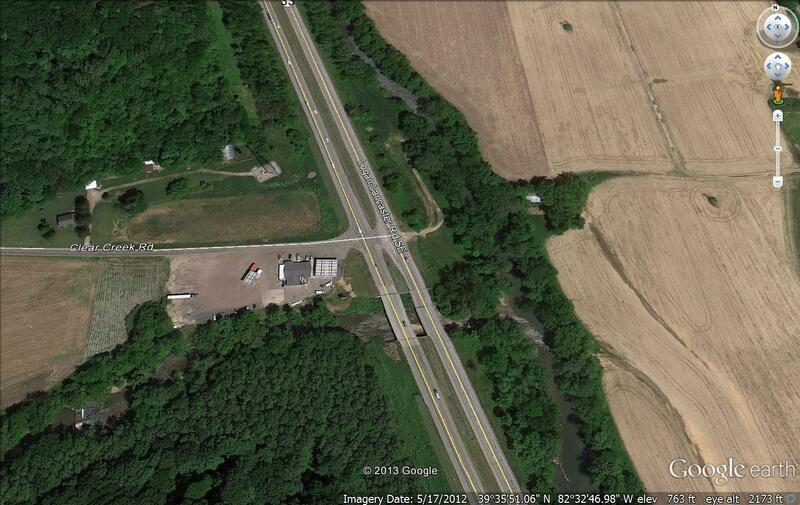 Not remembering which type of gas station it was and wanting to tip them to the name, I ducked into trusty Google Earth. Google Earth has made great strides since its introduction eight years ago. Motorized Googleians have driven nearly every road in the Americas, it seems, and this has allowed for an extremely cool feature known as "Street View". Clicking that allows us to come down to the ground and see relatively high resolution images of the roadway and its roadside attractions. 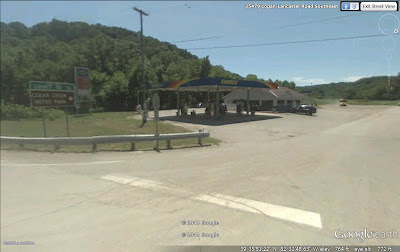 By entering Street View, I quickly saw that the gas station rendezvous site was a Sunoco, and could pass that info to the other party. I was also interested to see that the imagery, which is probably a year or few old, was made in summer. 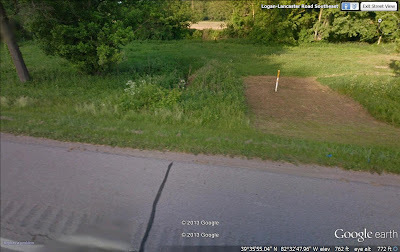 Knowing that a rare plant, Glade Mallow, Napaea dioica, grew directly across from this intersection, in the ground between U.S. 33 and the Hocking River, I toggled the Google Earth Street View camera in that direction. They make these images with a car-mounted camera that shoots in all directions, and you can scan in any direction from the roadway. So I aimed it into the ditch, and Voila! There was my rare plant. They are the plants capped with white flowers, just left of that area of bare dirt. Now we're on the ground and your blogger is taking up the camera duties. 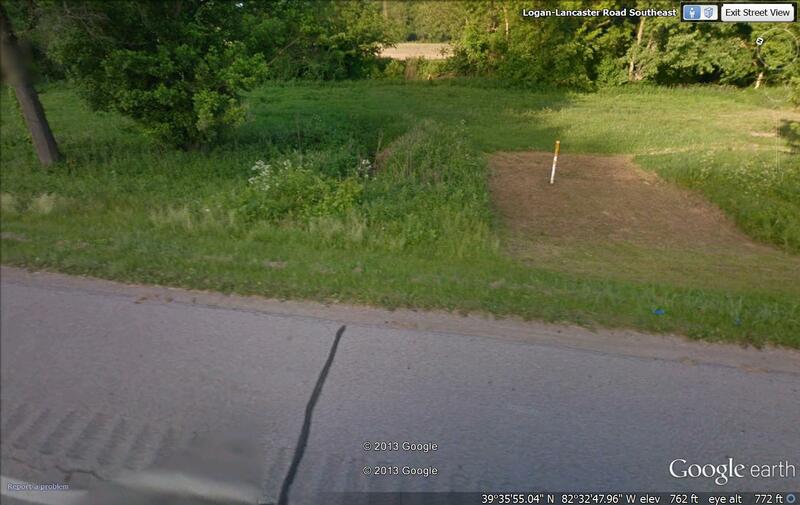 This image looks north on U.S. 33, and the Glade Mallow grows in profusion between the mowed verge and the trees. Glade Mallow is a stunner by any botanical standard, and we caught it just as it was entering peak bloom. It is a massive member of the Mallow Family (Malvaceae), and luxuriant stems might stretch six or seven feet skyward. The leaves are roundish and deeply cleft; suggestive of Marijuana on steroids. The crystalline flowers with pinkish stamens grow in densely capitate clusters. Individually, they seem too small for the robust plant that supports them, but massed in unison all seems in harmony. I personally think Glade Mallow would be an awesome plant for the adventurous gardener, but I rather doubt anyone has taken it into captivity and is cultivating it. This rather innocuous tubular green bag of goo is one of the reasons why I'm so interested in Glade Mallow. About 20 years ago, I made a collection of Glade Mallow in Pickaway County, Ohio, and upon returning to the office with my material, I dumped it out to sort things. 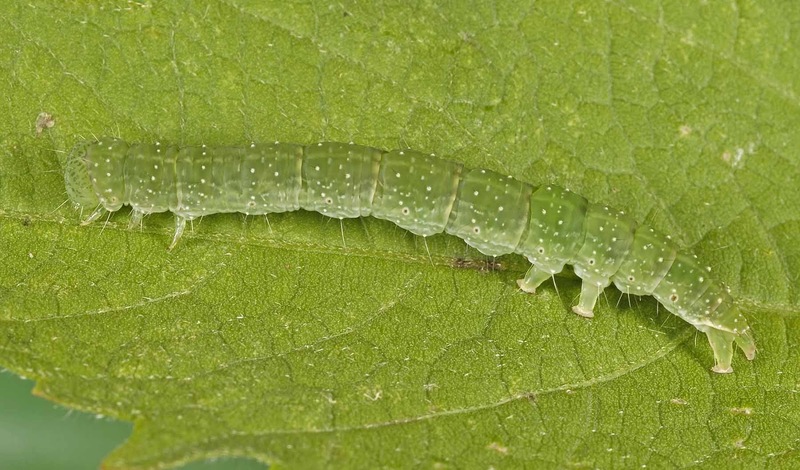 When I handled my Glade Mallow specimen, a beautiful caterpillar just like this jumped from the foliage. I was interested enough that I took it to a lepidopterist who specializes in moths, and he raised it to adulthood. Darned if it didn't turn out to be a major rarity, Bagisara gulnare (a type of noctuid moth; I know of no common name). David Wagner was exceptionally keen to find caterpillars of this species, as no one has reared them or studied the life history. We made attempts to find some last year when Dave was here, but failed. This year, following Mothapalooza, he and I stopped and worked a giant stand of Glade Mallow in Ross County, and within 20 minutes had secured 13 caterpillars. Dave has these livestock in his lab back at the University of Connecticut, and most of them have entered the pupal state. 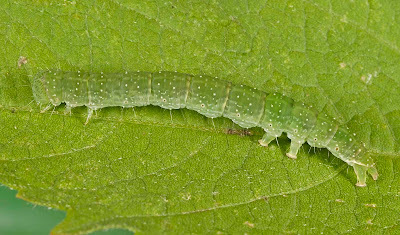 His photo, two images up, is of one of the caterpillars that we captured back on June 16. This map needs updated a bit; at least two Ohio dots are necessary. But you can see that Bagisara gulnare is a great rarity, hence our interest. When I found the caterpillar back in the 1990's, the host plant was unknown, so my discovery cracked that code. Now that we know what the caterpillars eat, and when they are out, it should be possible to find additional sites. I'll probably try and get out and check a few places in early August, when the moths should be on the wing, and see if I can find and photograph them. This strange-looking structure is the main water intake for the City of Cleveland, and it lies about three miles out in Lake Erie (although it's labeled "Five Mile Crib), offshore from downtown. I made this image while assisting with an aerial waterbird survey back in November 2009. In a big lake largely free of other protuberances, the intake structure sticks out like a sort thumb, and everyone asks about it upon seeing it for the first time. Well, the City of Cleveland was good enough to mount a camera on the "crib", and stream live video to us, the viewers. 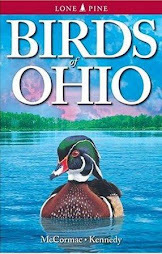 Cleveland birders Jen Brumfield and Chuck Slusarcyk brought this to our attention the other day via the Facebook Birding Ohio page, and the Ohio Birds Listserv. They report hundreds of Chimney Swifts mustering around the crib, and were able to identify several other species. I will guarantee you that the local Peregrine Falcons also make trips out there to hunt, and perch. The congregation of swifts is particularly interesting, and curious minds want to know if they somehow roost on the structure. Hopefully someone will find out. The Cleveland lakefront hosts massive numbers of Chimney Swifts in migration, and maybe some of them have found an out-of-the-norm roosting site. Anyway, if you want to view the cam and life three miles out in Lake Erie, CLICK HERE. Such a woodpecker as this would be sure to cause one to take a second glance, and a third glance, and run fast for the camera. Fortunately, Irene Kohne did just that, and was able to make some nice images of this "Ivory" Woodpecker (No, not Ivory-billed Woodpecker!). This bark-pounder has been coming to her Brown County, Ohio feeder and is apparently doing just fine. It is a leucistic (loo-kiss-tik) Red-bellied Woodpecker, Melanerpes carolina, and is certainly far from typical for that species. Leucism is a genetic abnormality that causes normally dark melanin pigments to become washed out and pale, leading to such animals as "piebald" White-tailed Deer, or white-patched American Robins. A quick glance around the Internet revealed a few other examples of leucistic Red-bellied Woodpeckers, but none so fine as Irene's ivory-colored bird. This fellow is nearly wholly white, but notice the small amount of red bleeding through on the crown patch on the forehead, which indicates its maleness, and some brownish coloration bleeding through on the underparts. I suspect the dark-tipped tail feathers are the result of staining from the bird propping itself against various surfaces. Magnificent animal, and here's hoping it lives long and prospers. Thanks to Irene for sharing! A typical male Red-bellied Woodpecker. There's lots of types of photography, and my bag, obviously, is natural history subjects. Even within that sphere, there is quite a range of topics: birds, bugs, plants, landscapes, etc. To cover the gamut requires multiple lenses, if you are using a DSLR. Of all the possible subjects to found in the natural world, my favorite to shoot are the little things. Macro photography is quite rewarding, at least to me, and good shots can bring to life up close and personal the wee flora and fauna that our eyes largely skip over. I look at this picture and nearly cringe, thinking how far the photographic addiction has taken me. A short eight years ago, I got my first digital point & shoot, and steadfastly resolved NOT to EVER get into SLR cameras and their interchangeable lens. If things went that far, I reasoned, I would end up devoting more time to photography and less to covering ground and finding the maximum amount of COOL THINGS when afield. Well, no regrets on the burgeoning camera addiction, at least yet. Anyway, macro photography (shooting small subjects) is often challenging and requires a good combination of gear. The rig above is the best combo I've hit on so far. The camera body is Canon's stellar 5D Mark III, and bolted to it is their superb 100 mm macro lens. That pairing is tough to beat. But one issue that oft arises when engaging in macro work is the need for flash. I've tried several rigs, and finally got the strange contraption that is wired to the camera, above. It is the Canon MT-24 EX Twin Lite flash unit, and so far I love it. The outrigger lamps at the end of the camera barrel can be rotated in any direction, or quickly unsnapped and held anywhere within the range of the power cables. 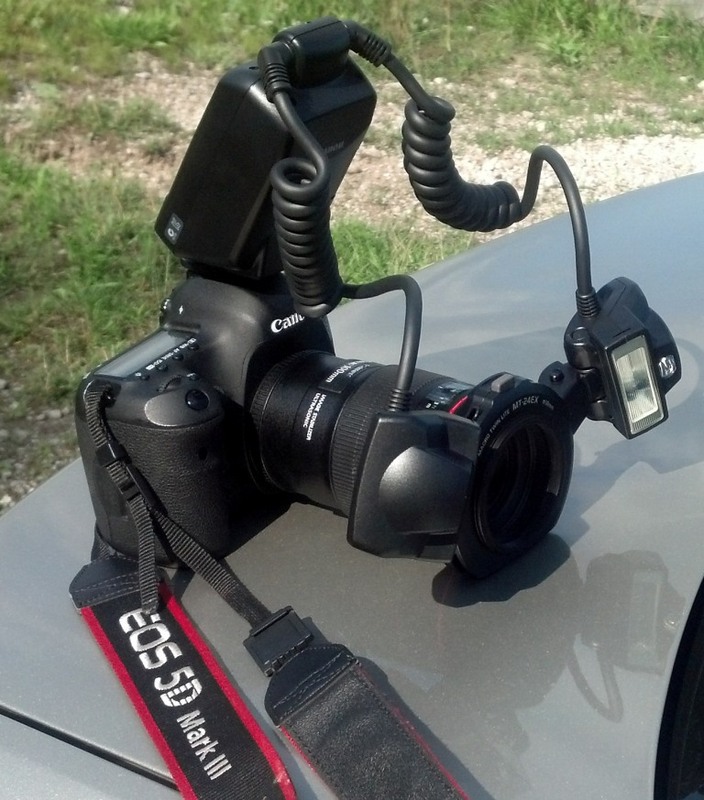 This provides excellent lighting versatility in a fairly portable package. Last Thursday, I found myself at the Lakeside Daisy State Nature Preserve in Ottawa County, camera and newfangled flash system in tow. I - duh! - wanted to test it out, and knew there'd be scores of suitably tiny subjects at the preserve. The flower above is attached to one of our rarer mints, the highly aromatic Limestone Savory, Calamintha arkansana. Those flowers are only a few millimeters across, and a soft flash allowed me to obtain a steadier image, and send some fill flash up into the flower's innards. One of the best things about flash is that it allows you to shoot a faster shutter speed - important when photographing objects that are prone to movement. Insect photography can be highly rewarding, but it's also challenging. One must often stalk the subject for some time, and might be lucky to get a few good opportunities for a shot. When an opportunity presents itself, you don't want to miss it. The animal above is a male Calico Pennant, Celithemis elisa, teed up on the tattered and aging receptacle of one of our rarest plants, the Lakeside Daisy, Tetraneuris herbacea. Following are a few more shots of small stuff, taken with my new rig. Looking quite different, and arguably even more beautiful, is the female Calico Pennant. This is a male Band-winged Meadowhawk, Sympetrum semicinctum, with its cherry-red body. As with many dragonflies, the female Band-winged Meadowhawk is sexually dimorphic: it is visually different than the male. This individual was quite cooperative and allowed me to get right up in her grill. Gusting breezes swayed her perch however, adding to the challenge of making a crisp image. To me, this was the most pleasing subject of the day: one of our tiniest damselflies, the Citrine Forktail, Ischnura hastata. One of these beasts measures less than an inch long, and they stay low to the ground in the vegetation. It is extremely easy to walk right through a posse of forktails and never notice them. Seen well, the animal is a thing of great beauty. This one is perched on a fairly rare plant, the Narrow-leaved Summer Bluets, Stenaria nigricans. It is consuming some tiny bug so small it is nearly invisible. Dragonfly/Damselfly Photo Tip: Furtively and discreetly stalk your photographic prey until it catches a victim. Once settled in with a meal, damsels and dragons are less apt to flush, and often allow closer and easier approaches. The hypnotic mass of Purple Coneflower, Echinacea purpurea, disk flowers seems to move and rotate if you stare straight at it. A good macro setup opens up worlds that would otherwise go largely unnoticed. Epic battle between kingsnake and copperhead! A while back, I wrote about Black Kingsnakes, Lampropeltis getula, and shared some images of one of these fabulous beasts. You can see that post RIGHT HERE. Kingsnakes are not a widespread animal in Ohio, occurring only in perhaps a half-dozen of our southernmost counties. The snake that was the subject of the aforementioned post was one that John Howard had caught that morning in his Adams County garden; later that same day I went on to find another elsewhere in the county. A noteworthy quality of the Black Kingsnake is its tameness and gentle nature, at least towards humans. When first captured, a kingsnake might be a bit feisty, but they normally soon settle down and are quite easily and safely handled. I have been around enough kingsnakes to know firsthand of their docile nature; a behavior that seems quite surprising when one learns what true tough guys these reptiles really are. 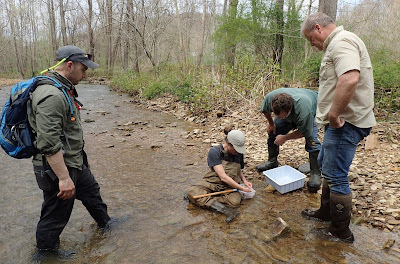 Last Saturday, botanists Andrew Gibson and Michael Whittemore were exploring Shawnee State Forest when they stumbled across a true battle of the reptilian titans. Andrew (check his great blog HERE) was kind enough to send along some of his characteristically excellent photos, documenting an ophidian fight to the death. Can you imagine stumbling across this scene?! It would either be the stuff of which long-lasting nightmares are made, or, if you're like me and many of my friends, a dream come true! Black Kingsnakes are well known for going after, killing, and consuming other snakes, notably venomous snakes. While this bit of interesting herpetological knowledge is well known, it is one thing to read about such behavior in a book, and quite another to actually experience it firsthand! 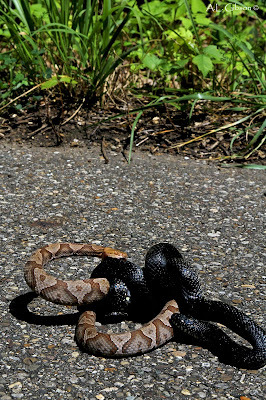 While cruising one of Shawnee Forest's little traveled back lanes, Andrew and Michael came across this scene, stopped, and obtained what is certainly among the best photo-documentation there is of a Black Kingsnake plying its trade. 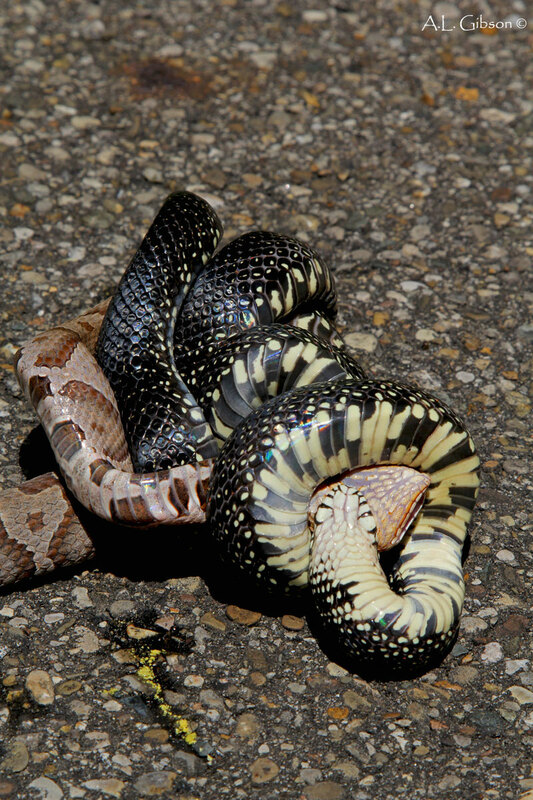 I don't think that I need point out which of the serpents is the kingsnake; the other is the most common of Ohio's three venomous snakes, the Northern Copperhead, Agkistrodon contortrix (I've written about them HERE, should you be interested). The kingsnake has engaged the copperhead, and is working to subdue its venomous relative. You'd think an animal with the fortitude to pursue such fare would be a raging, barely containable maniac of an animal, but as I pointed out when in our hands kingsnakes are about as soft and snuggly as a snake can be. That demeanor changes bigtime when on the hunt, obviously. 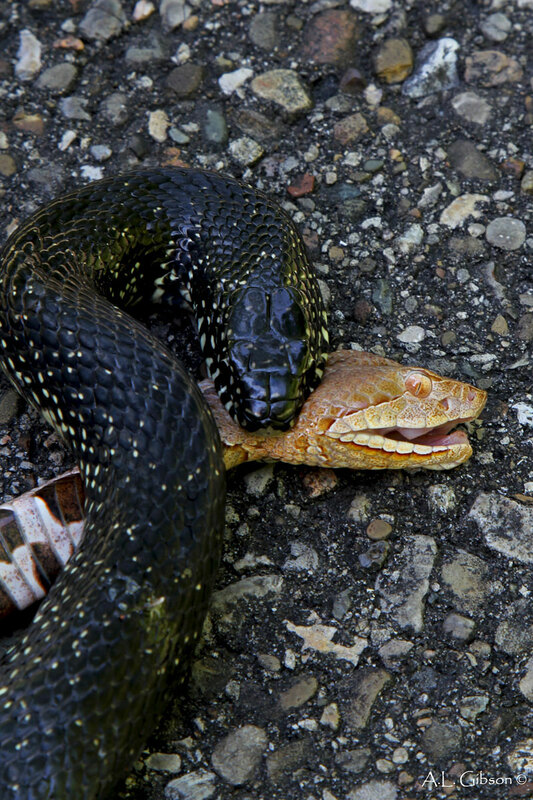 At this point in the struggle, the agile kingsnake has gained the upper hand and has the copperhead in a death grip. 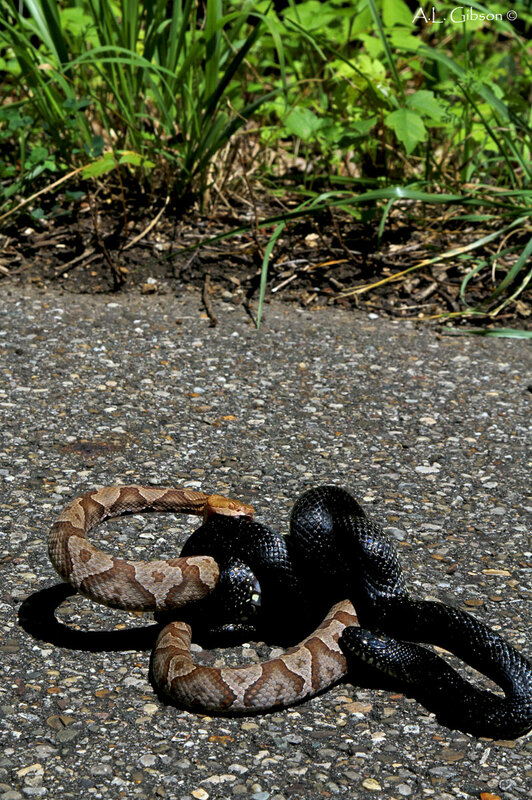 The copperhead, of course, would have attempted to defend itself with all of its might, but kingsnakes are impervious to the bites of chemically protected snakes such as this, and the copperhead's bites left it unfazed. By now, the copperhead is doomed. 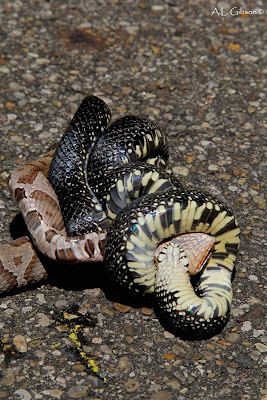 The crushing death-grip that the kingsnake has on the throat of the copperhead probably brings about its demise fairly quickly, as does the kingsnake's tightly coiled body, which crushes the life from the unlucky victim. Death by constriction, essentially. Congratulations to Andrew and Michael for a great find, and to Andrew for the excellent photo-documentation, and for allowing me to share his images with you.